Honey offers function-specific, well-defined, specialty bikes for dedicated purposes. Honey's line includes over a dozen bike styles, each designed for a very specific use. No Honey is a re-purposed bike. No Honey is a mix of uses. Honey designed each bike's style and function from the ground up—including tubing choices, bike fit, handling, and components—for a very specific and narrowly defined purpose. We divide Honey bikes into two broad categories: Drop Bar Bikes and Flat Bar Bikes. Not sure which model might be right for you? Or want more information about a specific model? contact the Beekeepers. Final 200 Meters: Designed for criteriums and US road racing, this bike will accelerate you fastest through the final 200 meters of any race. This is the stiffest steel bike on the road. Race Day: Designed for 60-100 mile US road races. 100% race fit, handling, and performance. Stiff drivetrain with a smooth ride for longer distance road racing. Road Day Ride: Designed for all-day riding—centuries and single day excursions. The Honey Day Ride series offers a stable, comfortable, slightly more upright bike than a "standard road" bike. MidDurance: Available as the MidDurance Steel or MidDurance Titanium, this progressive design is a performance endurance bike. Ideally suited for randonneuring or the "long ride" on any road -- pavement, dirt, or gravel. It fits fenders for the harsh weather season and even fits studded tires for cold winters. A true four-season bike. The MidDurance is a medium-reach caliper brake bike for light weight and tire versatility. The bike fits up to 33mm slick tires, 32mm knobby tires, and 30mm studded tires. Available in steel or titanium. Randonee: This is a pure randonee and brevet bike. Designed with stable geometry for predictable handling - even when you're on your 20th hour in the saddle. Comfortable, classic, durable. Touring: Designed for the most serious multi-day loaded pannier riding. 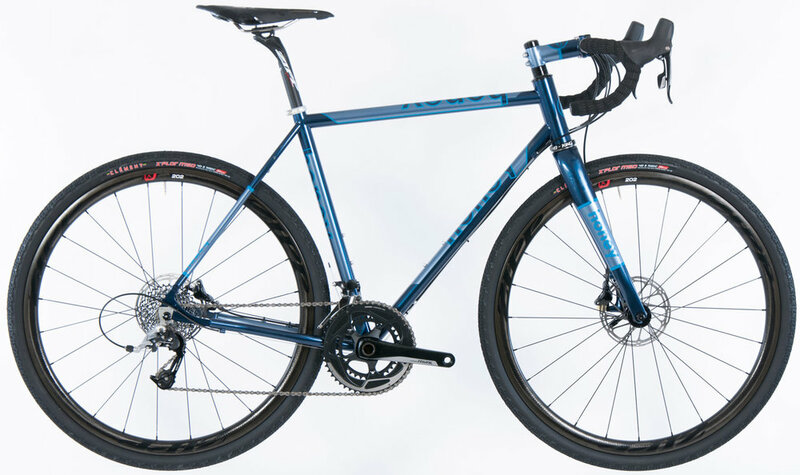 Allroads: Available as the Allroads Steel or Allroads Titanium, this is a next generation, forward-looking mixed-terrain bike that will be happy on any road -- paved or gravel -- and a lot of singletrack. Disc brakes and 650b x 47mm and 700c x 43mm wheels make this a super versatile choice for all kinds of surface conditions. MidDurance: Available as the MidDurance Steel or MidDurance Titanium, this progressive design is a fast performance endurance bike. Ideally suited for the fastest "long ride" on any road -- pavement, dirt, or gravel. It fits fenders for the harsh weather season and even fits studded tires for cold winters. A true four-season bike. The MidDurance is a medium-reach caliper brake bike for light weight and tire versatility. The bike fits 700c wheels with up to 33mm slick tires, 32mm knobby tires, and 30mm studded tires. Available in steel or titanium. Cyclocross Race: Designed specifically for contemporary American UCI sanctioned ‘cross racing. Very quick handling and tight geometry. Cyclocross Euro: The Euro is ideal for fast non-technical courses that demand more speed than finesse. This bike features a very high bottom bracket mated to a super stiff road-bike-like feel. Cyclocross CX1 Disc: Honey's disc-specific cross race bike specifically designed for 11x1 drivetrain setup. Low-maintenance, all-performance, and perfect for the harshest of conditions. This may be the perfect New England race bike. Cyclocross Singlespeed Disc: Racing singlespeed cross demands every watt of power to be transferred through the frame to the rear wheel. We've designed the Honey Singlespeed to deliver on this promise. Stiff, light and simple, the Singlespeed Cross may be the perfect race bike. The disc version of our Singlespeed is best suited for harsh weather and the toughest race courses. Cyclocross Utility: Designed for cross racing, riding, training, and whatever else you want to do with this bike. Super versatile and very race worthy. Allroads: Available as the Allroads Steel or Allroads Titanium, this is a next generation, forward-looking disc brake design. The Allroads is so versatile that a number of riders have been racing -- and podiuming -- these in cyclocross events. The Allroads shatters preconceived notions about what a 'cross bike needs to be. Equally at home on the race course or a hundred miles into the woods, the Allroads will change the way you ride. 700c x 43mm and 650b x 47mm wheels make this a super versatile choice for all kinds of surface conditions. Packmule - Drop Bar: The Packmule is Honey’s all purpose bikepacking machine. The Packmule can go just about anywhere and handle just about anything. It’s not the fastest bike that Honey makes but it is the bike that promises the most adventure per mile. Travelall - Drop Bar: The Travelall is Honey's bikepacking fat bike. This bike really is for traveling anywhere, anytime, over any distance. This is the ultimate super-duty bike. Tandem Road: Designed to fit: with 27 size options, Honey's fully loaded tandem series is ready for serious multi-day riding. Honey Road Tandems include disc brakes and are ready for fenders and front and rear panniers. Mountain 29er: Contemporary hardtail series. Quick handling and tight geometry. Mountain 27.5": Contemporary hardtail series. A perfect balance of comfort and agility. Alltrail Titanium Converter: We’ve optimized this bike to handle 27.5 x 3.0” wheels and 29 x 2.25” wheels equally well. This bike performs on a wide range of trail and weather conditions. Packmule: The Packmule is Honey’s all purpose bikepacking machine. The Packmule can go just about anywhere and handle just about anything. It’s not the fastest bike that Honey makes but it is the bike that promises the most adventure per mile. Travelall: This is our bikepacking fat bike. This bike really is for traveling anywhere, anytime, over any distance. This is the ultimate super-duty bike. BiFrost Titanium Converter: Our dual wheel offering that you can ride with either 26: fat tires or 27.5” plus tires. The bike works equally well with either tire system. This is an all season bike for all kinds of terrain. Offtrail: There is no off season with the Offtrail. This bike can take you anywhere over anything for all explorations. Tandem Mountain: Yes; mountain tandems.